Because the most important is not just to travel but to enjoy doing what you like. Ask about our cooking activities that take place during your stay in Barcelona! We have two rooms for you in the heart of Avinguda del Paral.lel. The elegant facility has a kitchen, WiFi and everything you and your group will need. An elegant 75 square meters apartment awaits you in Barcelona. Its modern decoration and the roomy spaces will guarantee your comfort. It can accommodate couples, families or groups of up to six members, and inside you will find everything you need to feel that you are at home in the Catalan capital. It has two double bedrooms, one with a double bed and the other with two single beds. For the convenience of travelers you will also find two bathrooms. There is a sofa bed for two people, TV and DVD for entertainment in the living room and you will have free WiFi access while you are inside. It will be an unforgettable trip! If you like to prepare your own meals, you will love the kitchen of the apartment. It is fully equipped so that you can prepare the delicacies you prefer. The terrace allows natural light to enter into the apartment, and offers a different space for breakfasts or outdoor conversations. Go out and observe the lifestyle of the area and enjoy a pleasant moment with your fellow travelers. 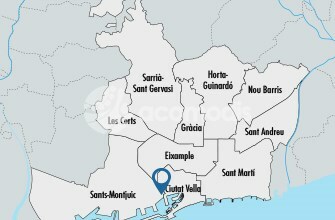 The apartment is located on Avinguda del Paral.lel, in the district of Sants Montjuic. The avenue connects two important points of the city which are: the World Trade Center and the Plaça d'Espanya. Go out and see it, get to know its restaurants and theaters and enjoy the charming district. You will also find the metro of the zone is close by, so it will be easy for you to go to any neighborhood without any impediment. Make the most of your visit! The district of Sants Montjuïc houses many places of interest that will make you fall in love with the area. You can go to Poble Espanyol, an outdoor architectural museum that children and adults will enjoy alike and that will give you a glimpse of the most important constructions in Spain. Avinguda del Paral.lel, which connects the World Trade Center with Plaça d'Espanya, is full of restaurants, bars, theaters and other places for different tastes. It is a very pleasant promenade and as you wander around, you will find places that you will love. You can also visit Fira Montjuïc, a space for congresses, conventions, exhibitions, concerts and the most important events of the city. Do not miss the Magic Fountain show in the evening! It puts water dances together with music and lighting. Your visit to Barcelona will be unforgettable. Helpful management, clean accommodations, great location and we fell in love with Barcelona! The big bonus was seeing the New Year's Eve fireworks from our balcony! Great location! Metro, supermarket, lunch at your feet, literally. 10 min walk to Las Ramblas, 10 min walk to hop on hop off bus stop. The apartment was quiet and comfy, nice balcony, spacious room. Well equipped: washing machine, kitchen utensils, blow dryer. Clean and spacious close to the main sites of Barcelona, perfect accomodation for a city break. Our host was very helpful both before and during our stay and made us feel very welcome as well as organising our transport to and from the airport. I would definately recommend this apartment. Everything was beyond our expectations. We highly recommend Acomodis and if we happen to be in Barcelona again - We will definitely stay at the same property. Erik was very helpful, pleasant and polite. Thank you - oh what an excellent choice!